The element has an “if yes” (green) and “if no” (red) connector. If your contacts’ score changes, they are affected by the action you’ve connected to the “if yes” connector. Contacts who don’t have that particular score move down the path to the action you linked to the “if no” connector. Note: When you use If score as a start element, link the next element only to the “if yes” connector. Only the contacts who have the new score can “enter” this element at the beginning of a workflow, so the “if no” connector simply can’t trigger any action. How do I set up the condition? Add the element to the workspace. Under Properties, select the score value. Select the time setting for when to assume the condition hasn’t been met. For more information on how to do this, go to How do I use time settings in condition properties. (Optional) Set the condition to run multiple times. For more information on this option, go to Can I run specific actions and conditions multiple times. How do I assign scores for the condition to work? The If score condition allows you to find contacts who receive a specific scoring value. The contacts’ score can change in another workflow. You can also assign it to them using Search Contacts. For example, you’d like to send a special offer to new contacts who subscribed via API. You can create a workflow that gives them a certain score. 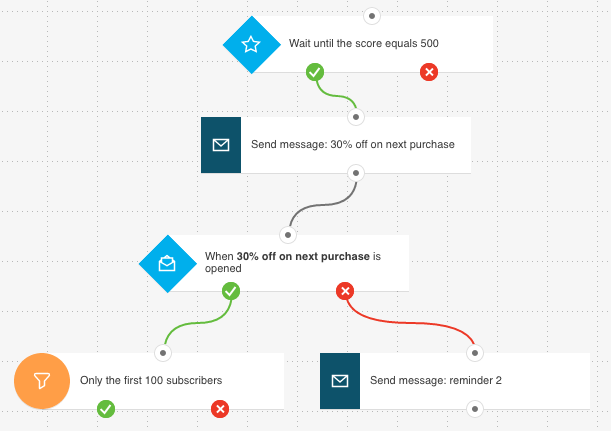 You’ve also built a workflow that finds the newly scored contact and sends them a special offer email. 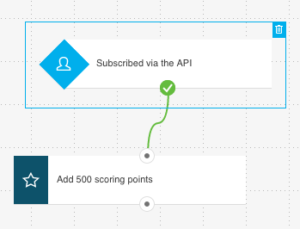 The If score condition doesn’t work for contacts who received that score before a workflow starts, or before they “reach” that element within a workflow.